Oh what a circus oh what a show! Round two of the Northern League began with an unnecessarily early start in the urban wasteland that is the Don Valley. There’s lots of facilities but getting breakfast at 08:30 Sunday wasn’t that easy. The scheduled start was 08:15 but the day before I learnt that the start time had to be put back to 09:00. In the end we were allowed inside at 08:30 but then had to wait until 09:00 to start the games. For this round Graham & I used my Ilkhanid army with Armenian allies to provide a battle group of knights for some real shock troops. A Mongol civil war! Mike Goss and Colin Betts fielded their Mongol Conquest army. They choose steppe for the terrain and fielded a small army with lots of superior cavalry and elite troops. We attacked and had some early success until Colin handed over the dice rolling to Mike when things improved for our opponents. However, things went our way for most of the game. It was a good job too as we had to break two battle groups twice after Mike & Colin rescued them before they left routed off the table. This was the only first round FOG game to finish. We actually finished quite a bit early. Sadly, the Armenian knights played no part in the game; they just rode around looking pretty. For the second round in succession we faced a wall of heavy infantry in our second game. 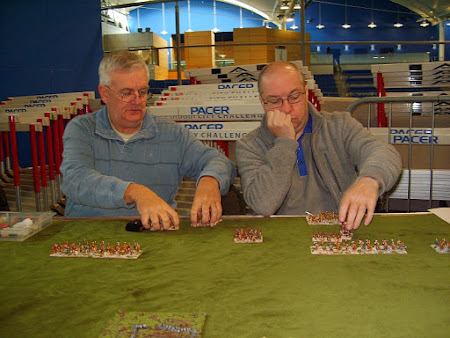 Peter and Richard Butler fielded large pike blocks across two thirds of an open table with lots of medium and light foot to contest the difficult terrain that formed their right flank. After last season one of things we had to learn was how not to lose heavily when things were against us. We achieved this in this game. I deployed some light horse very badly indeed and blocked the only real attacking option we had. I blame the disgustingly early start. Despite this we caused some damage and held on for losing draw. 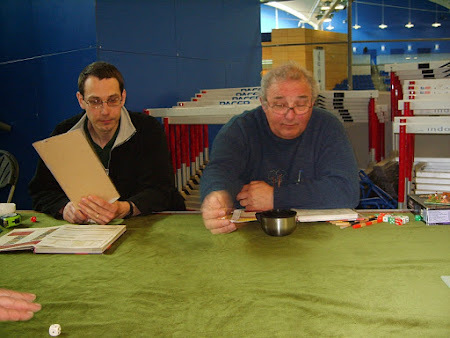 As far as the competition went, by holding on until time was called, we denied Peter & Richard 10 points: 5 for breaking our army and 5 for breaking an army two classes higher. Even so Peter & Richard finished in second place.